Staged to Sold. Creating spaces that reflect beauty, imagination and peaceful passion. 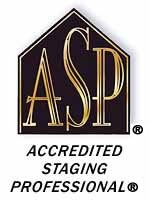 As a Certified Staging Professional, your home will be my easel, uniquely deigned into a luxury portrait that every buyer will fall in love with and every broker will be competing to sell! Not selling, but would love a change of scenery? Lets talk, lets meet, lets have fun together rearranging and redesigning. A "new look" inspired by a fresh, personal perspective!